This easy DIY project is made with two recycled fashion items: a skirt and a braided belt. I love to create something new from something old. I bought both the skirt and the belt at a local thrift store for three Euro’s total. I think it’s a lovely gift for a teenage girl. My skirt bag now belongs to my sister! 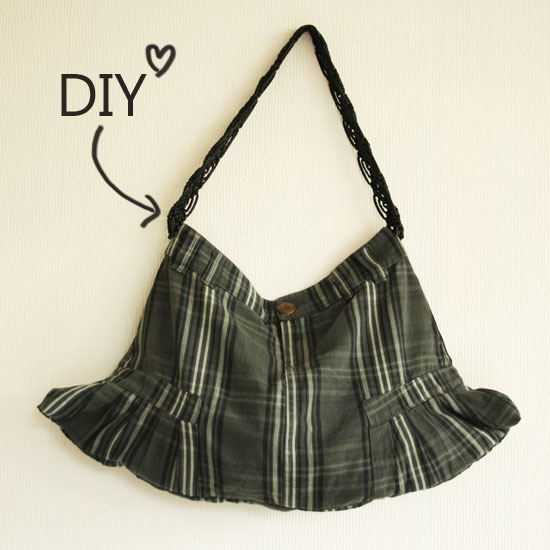 Learn how to make a bag from a skirt and a braided belt after the jump. . .
1. Lay down your materials. 2. Pin the bottom of your skirt together and stitch. Leaf about 2 inch on both sides. 3. Fold the fabric like shown in the picture and pin. Sew together. 4. Attach the belt to the skirt. You can do this my making two little holes in the fabric on both sides of the skirt bag. Put the ends of the braided leather belt through the holes and make a knot.